Click here to visit the Splenda facebook and like them. 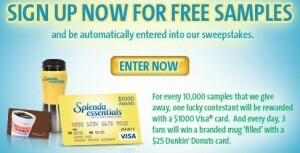 Then on the “Splenda Essentials” tab you should see “Signup Now For Free Samples” (like the picture above). Click enter now below it and on the next page you’ll be able to request your free sample of Splenda Essentials. You’ll also automatically be entered to win a $1,000 Visa Card and every day, 3 fans will win a $25 Dunkin’ Donuts gift card. Looking forward to a splenda day!!!! !